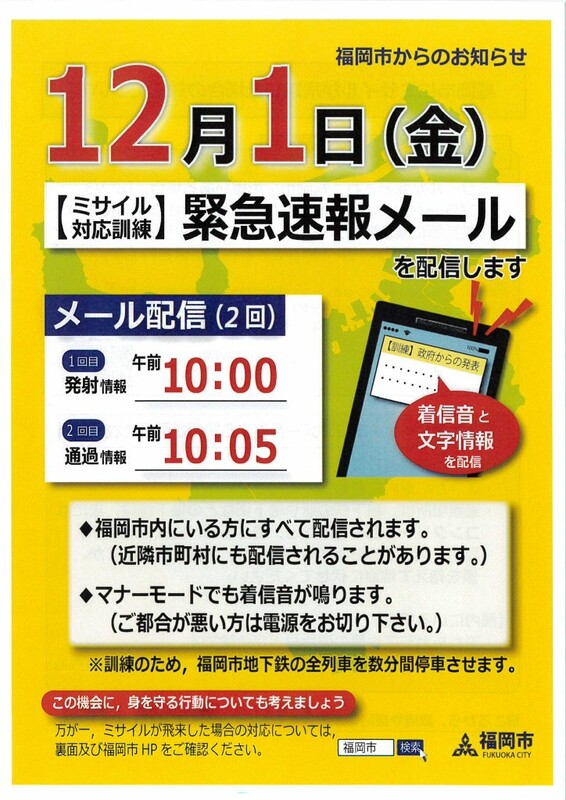 Fukuoka City will be conducting disaster drills via text messages sent to mobile phones, on Friday, December 1. Drill alerts will be sent twice, at 10:00 a.m. and 10:05 a.m. to all phones in the city, to simulate what might happen in the event of a missile strike. While the text itself will be in Japanese, at the end of the message it should show text that reads “this mail is for drill”. There is no need to evacuate or otherwise take refuge. However, please note that this alert noise will sound even if your phone is in silent/manner mode, so if for some reason it would be inconvenient to have it make noise, please turn your phone off. We ask for your understanding and cooperation in this missile drill. For more information, please see the linked page.